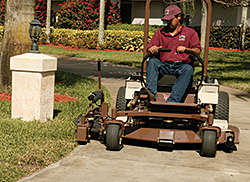 Edge-Eze™ maintains a clean, sharp edge along sidewalks, roads, and driveways, eliminating time-consuming hand edging and reducing edging time by up to 75 percent. With a 2.5-inch depth of cut — from hub to edge of disc — the attachment enables users to maintain established edges at up to 500 feet per minute. A 12-inch vertical adjustment allows users to edge from the sidewalk, turf, or curb. It mounts in place of a standard discharge shield, and an optional electric actuator increases downward pressure in tough conditions and raises the disc to cross sidewalks.